We've already had one round of sickness already this year, so I decided we need to start taking some elderberry syrup both as a preventative and during any illness we may have. Purchasing name brand elderberry meds can get really expensive, especially for a family of 5. I am finding that making it myself is a much less expensive option! Elderberry is rich in vitamin C, antioxidants, flavonoids, beta carotene, calcium, phosphorus, potassium and a whole host of good-for-you things. Elderberry syrup is not a new thing--it has been used for generations. After all of that information, let's move on to the actual recipe! I used the recipe at Mountain Rose Herbs for reference, leaving out the optional stuff. With my allergy/sensitivity issues, I figure the less ingredients the better. Since our elderberries at the farm didn't produce well due to the drought this summer, and I used all of the ones I had in the freezer, I purchased a pound of Frontier Organic Dried Elderberries from the local health food store for $14.99. I wanted to order from Mountain Rose Herbs, but they were out and I wanted to get some ASAP. I also purchased local(ish) honey from the local health food store for $2.99/lb. 1. Put the elderberries and water in a pan, bring to a boil and simmer 30 mins. 2. Mash your elderberries. I used a potato masher. You could use a spoon or carefully use an immersion blender or something similar. Be careful--the juice will stain! 3. 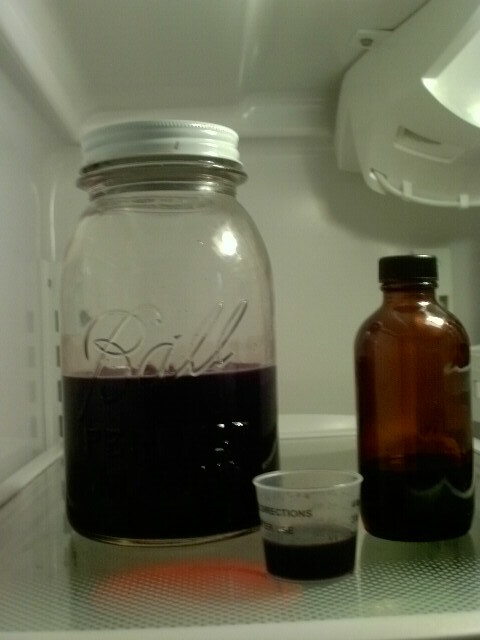 Strain your elderberry water into your sterilized jar, pressing to get as much juice out as possible. 4. Pour out a small amount of hot/warm elderberry juice into a small bowl and mix with honey. 5. Pour honey mixture into jarred elderberry juice and stir until combined. I ended up with a little over 3 cups of syrup. I expected closer to 4 cups, but I left the stove for a bit and came back to a non-simmering pot, then turned it up and it was boiling. Oops. Dosage: For everyday maintenance, 1 TB daily. When you are fighting an illness, take 1tsp every 2 to 3 hours. For ease of pouring, I am repurposing a smaller bottle. Cost to make this batch came to $4.37. That is less than half what a little bottle of Sambucol would cost me! I actually like this homemade version better than Sambucol! Obviously, if you have a little one under 2 years old, you may want to use a different syrup other than honey. 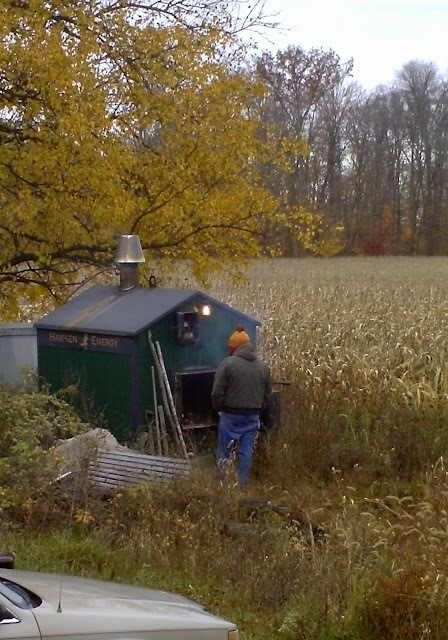 Well, hubby decided to fire up the outdoor wood furnace this last weekend. The weather has become decidedly chilly (nd windy!) and I guess the house needed a little bit more warmth than we were willing to crank up the propane. Here's the hubs out tending the fire. And.....we need more wood! 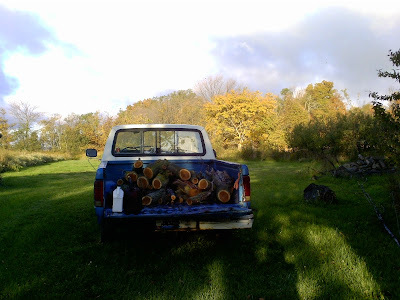 Unfortunately, our usual backup wood supply does not have wood to offer the public this year. Apparently, they weren't able to get into the woods last winter due to the wet, non-freezing weather we had. Bummer! Honey Lemon - Good for What Ails Ya! I saw this idea a few months ago on Pinterest and promptly forgot about it. I was reminded when at the local health food store talking with one of the ladies there and made it the next day! Our household has been fighting a cold/cough virus, and I plan to be using this a lot! It's incredibly easy to make this concoction. Some people add Ginger to the mix, but since I am not certain whether Ginger is in the mix of spices I have been having some problems with lately, I left it out. I am told and have read that over time, the concoction turns into a gel-like consistency. For now, two days after making it, it's made a lovely lemon-infused honey to put into my tea! Slice your lemons as thin as you can and place in jar. If you're using ginger, place that in as well, mixing with lemons. Place closed jar in fridge to do its thing. 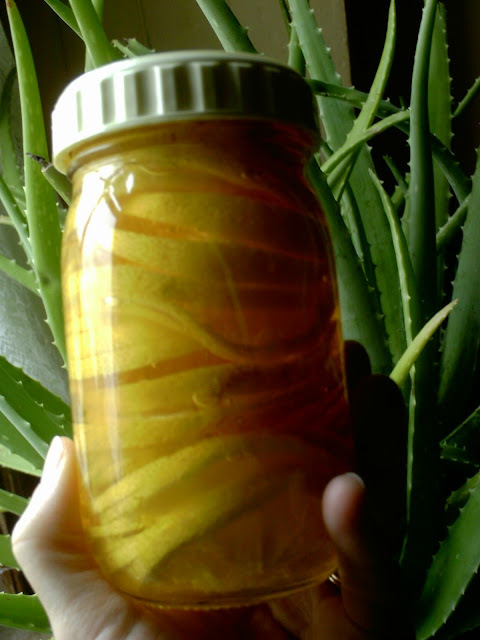 If you feel like it, you can turn the jar on its top to help the honey move around and through the whole lemon stack. When you need some honey-lemon goodness, simply spoon out what you need and replace jar to fridge. I have been adding this to my daily tea regimen, adding it to my black or white tea(you can use green, if you want). For kids(and adults) who may not want true tea, you can just put a dollop of honey lemon in a cup and pour hot water over it for a yummy drink. I recently picked up a bag of Mary's Gone Crackers! Sticks&Twigs Pretzels in the Curry Flavor. This was my first time to pick up a product by this company. I was on the lookout for some easy gluten-free snack food for a camping trip and this seemed like a good product to add interest to my repertoire. Two bites into the pretzels, I started having a niggling feeling at the back of my throat. My allergy reactions generally begin with an itchy feeling in the soft palate, so this was a little weird. I was unsure as to whether it was an allergic reaction, but assumed it was, considering it was the only thing I was eating at the time. I took an antihistamine just in case, and a few minutes later my ears started itching inside, so that pretty much told me it was most likely a reaction that presented itself a little differently. I'm glad I took the antihistamine. I've never had an anaphlactic reaction, so don't know what exactly it feels like, but this niggling feeling at the back of my throat did give me cause for concern. I have been doing quite well with foods lately. I checked out the list of ingredients and found that the ingredients listed were mostly things I have been eating and doing fine with. The only thing that I had questions on was the curry powder, as I know it can be made up of any number of different ingredients. In order to narrow down what it was I reacted to, I decided to contact the company via email. On first contact, the representative at Mary's Gone Crackers! was hesitant to give me the ingredient listing to their curry powder, instead inquiring as to what my allergies are and then they would tell me if any of them were on their list. As my readers with multiple allergy experience know, there is no allergy test that tests for every food or substance on the planet. There are false positives and false negatives in the testing in any case. Additionally, allergy testing only tests for what your body is likely to react to at the time of the testing; people can develop new allergies, and they can have reactions to things that do not show up on the tests. The most foolproof way to know you are allergic to something is whether or not you have been exposed to it and reacted. It is far easier to narrow down the cause of an allergic response based on what you have actually been exposed to. Giving my list from my allergy testing a few years ago would have gotten me nowhere, as my body has changed since then. I explained to the rep my situation and how I really wanted to get to the cause of my reaction to their product so that I can pinpoint the culprit ingredient and know what to watch out for in the future. They consulted with Mary, and responded with a listing of the curry powder ingredients. This was quite helpful to me, as two of the ingredients are things that I don't consume on any sort of a regular basis: fenugreek and cardamom. With a simple email, my possible reaction ingredients were narrowed substantially; something I greatly appreciate! Thinking about cardamom and fenugreek, those ingredients are also often in Chai teas, which I have an aversion to. Maybe it's because I am allergic to something in it and is best avoided. Funny how the pieces come together when a little more light is shed on the subject! The bummer of the deal is that I should probably avoid most Indian food, or at least have a heightened awareness, should I have it. The good part of the deal is that I won't have to avoid all of those other gluten-free grains and every other ingredient on the label in order to avoid the weird niggling throat reaction. I am willing to bet that I would probably be ok with their non-curry products. All this to say, Thank you, Mary, from Mary's Gone Crackers!, for understanding where I am coming from and being forthcoming with the specifics on your ingredient listing! You've made my life (and the lives of others with similar food issues) much easier! The fall colors are brightening up my corner of the world and the temperature has dipped to freezing in the nighttime hours. The farmers are out in their big combines harvesting the corn and soybeans, which means the ground is dry enough that we should be able to get into our woods and get firewood put up for the winter. We are going to need it, as our supplement source from previous years is not available this year. So, you probably don't have to guess what we will be doing on our weekends...oh well, it's good exercise!